Encapsulated Remote Switched Port Analyzer (ERSPAN) is a type of GRE tunnel which allows a remote Intrusion Detection System (IDS) or similar packet inspection device to receive copies of packets from a local interface. This operates similar to a local mirror or span port on a switch, but in a remote capacity. A typical use case for this is central packet inspection or a case where a remote site has plenty of bandwidth available, but no suitable local hardware for inspecting packets. On TNSR, this is accomplished by configuring an ERSPAN GRE tunnel and then configuring a span to link the ERSPAN tunnel a local interface. From that point on, a copy of every packet on the interface being spanned is sent across GRE. The receiving end does not need to support ERSPAN, a standard GRE tunnel will suffice. In this example, copies of packets from a local TNSR interface will be copied to a remote IDS for inspection. No configuration is necessary on the server. Any packet it sends which flows through TNSR will automatically be copied across the ERSPAN tunnel to the IDS. The IDS must support GRE interfaces and also must support inspecting packets on GRE interfaces. 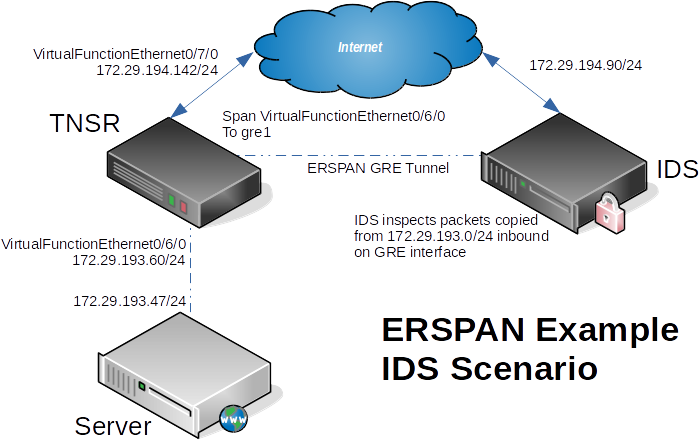 The IDS does not need to explicitly support ERSPAN to receive copies of packets from TNSR. Configure a GRE tunnel between the IDS and TNSR, it does not need to have an address internal to the GRE tunnel.